We’d love your help. Let us know what’s wrong with this preview of Andi to the Rescue by Susan K. Marlow. But it turns out embarrassment is the last thing Andi needs to worry about when two outlaws kidnap Andi and her mother after school in a case of mistaken identity! They can't even tell the kidnappers a mistake has been made without putting thems This is so embarrassing. Andi's teacher, Miss Hall, is sick--and Mother is the substitute teacher. What will Andi's friends think? To ask other readers questions about Andi to the Rescue, please sign up. I wasn't looking forward to reading yet another book where Andi gets kidnapped. This story, however, isn't not thrilling or overly dramatic. I did feel that to send a young girl like Andi off to get help was a little much, but of course she had to go to the rescue. Not my favorite book, but not bad. Looking for a book that’s wholesome to the brain, exciting to the senses, and at the same time a lesson that’s educational, godly, and perfectly suitable for a young one? Here’s the book for you! “Andi to the Rescue” is the 4th book in the Circle C Stepping Stones series by Susan K. Marlow. It’s wonderfully woven and makes you want more of her tastefully-written books. Though it says it’s for ages 7-10, it’s really for ages 7-100! It’s sweet, short, and perfect for little ones who are ready to re Looking for a book that’s wholesome to the brain, exciting to the senses, and at the same time a lesson that’s educational, godly, and perfectly suitable for a young one? Here’s the book for you! It’s sweet, short, and perfect for little ones who are ready to read something exciting but not scary; something more challenging than a choppy-sentenced storybook, but not TOO much more challenging. They will not be able to put this book down! 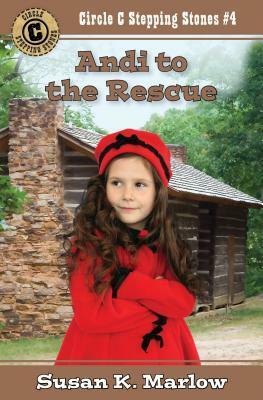 “Andi to the Rescue” is a great choice for your daughter (or even son)! The excitement goes on in each chapter. This story is about bravery, trusting in God, and obedience. After Andi and her mother, Elizabeth, are kidnapped, they must keep their identity to themselves or else they (and others) might get hurt. During their extended captivity, they are kept in an old shack; then Elizabeth knows she must take desperate measures in order to not stay the winter with their captors. She shoves Andi out the window, and it is up to Andi to now find her way to some people who can help them—which isn’t easy when it’s rainy and cold. She trudges on, though; no matter how scared and cold she gets, she must obey Mother. To find out what happens next, buy this book! Indeed, this story is worth every last penny—and every inch of 5 stars! I am a 13-year-old girl who received this book free from Kregel Publications to review. I made no promise that my reviews would be positive. This review is unbiasedly based on my own thoughts and opinions. In this story, Andi’s mother becomes a temporary substitute teacher for her school. Andi and her mother are leaving school and get kidnapped by outlaws and taken to a cabin. I enjoyed this story a bit more than Andi Lassos Trouble simply because I wasn’t as interested in all the “horse talk” in the first book. The story is adventurous and suspenseful but also very clean with good faith content. I really like Andi’s mother and how she reacted to many different situations. The author is very good at In this story, Andi’s mother becomes a temporary substitute teacher for her school. Andi and her mother are leaving school and get kidnapped by outlaws and taken to a cabin. The author is very good at describing the scenes and the pacing was very good. I also really enjoyed the history lesson about Black Bart at the end of the book. The extra true lessons are a great addition to the stories. I definitely recommend this series to young girls. ANDI TO THE RESCUE is an exciting adventure when Andi and her mother are kidnapped by outlaws - with guns! Andi is terrified but Mother remains calm, cool and collected. My heart thumped with Andi's as she tried to find her way down the mountain--and yet remember to mark the way so the Sheriff could find his way there to arrest the outlaws and rescue Mother. Girls will be spellbound by this beginning chapter book and likely want to read it through from start to finish. My young teen daughter was ANDI TO THE RESCUE is an exciting adventure when Andi and her mother are kidnapped by outlaws - with guns! Andi is terrified but Mother remains calm, cool and collected. My heart thumped with Andi's as she tried to find her way down the mountain--and yet remember to mark the way so the Sheriff could find his way there to arrest the outlaws and rescue Mother. Girls will be spellbound by this beginning chapter book and likely want to read it through from start to finish. My young teen daughter was totally engaged. I highly recommend this historical series for tween girls. Each book stands alone so no need to read them in order. Book four in the Circle C Stepping Stones series, Andi to the Resuce, by Susan K. Marlow is another fun and delightful story from this charming series that young readers will be sure to love. This story is a bit of an adventure, with kidnapping and outlaws involved. It teaches about being strong and brave, even when there are unexpected and scary situations. It is also about friendship and family. This is an engaging and well-written children’s story that readers, especially those that enjoy his Book four in the Circle C Stepping Stones series, Andi to the Resuce, by Susan K. Marlow is another fun and delightful story from this charming series that young readers will be sure to love. This story is a bit of an adventure, with kidnapping and outlaws involved. It teaches about being strong and brave, even when there are unexpected and scary situations. It is also about friendship and family. This is an engaging and well-written children’s story that readers, especially those that enjoy historical fiction and adventure, will be sure to enjoy. Andi thinks her worst nightmare has come true when her teacher, Miss Hall, gets hurt and can’t teach for a while. It is worse than she could have imagined when Andi’s mother becomes the substitute teacher. Andi is afraid the other kids will tease her, but her worries disappear when she and her mother are kidnapped and taken far away to a man who was looking for Miss Hall to teach him how A substitute teacher, a kidnapping, and mysterious men make the newest Circle C an adventure not to be missed. Poor Andi! She is always finding trouble either for herself or those around her. Of course, it's not her fault that trouble seems to follow her. Boy, she has herself in a fix this time and her poor mother is along for the ride. Andi and her mom have to time everything just right in this nail biter, if not bad things could happen. How will Andi see herself out of this one? The author makes the best readers for this genre. She takes real life similarities and she creates a fictional tale that will leave you on the edge of your seat. Age appropriate writing and events and its not too serious but not too boring. She walks a fine line between both and can keep the reader entertained, whether it be young or old. You are sure to like the Circle C Stepping Stones series. As with all books by this author, I loved every chapter of this book. Every review I write highlighting Mrs. Marlow's historical fiction is glowing. As I have with all her other books, I highly recommend this one. It is written for younger readers who will absolutely love it. It has the perfect blend of excitement and Godly character lessons to help children learn as they read. Not only that, readers will learn about the historical setting and time period, making these books five star! Parents As with all books by this author, I loved every chapter of this book. Every review I write highlighting Mrs. Marlow's historical fiction is glowing. As I have with all her other books, I highly recommend this one. It is written for younger readers who will absolutely love it. It has the perfect blend of excitement and Godly character lessons to help children learn as they read. Not only that, readers will learn about the historical setting and time period, making these books five star! Parents and teachers alike should give these books to their children to read. Andi to the Rescue is so exciting with the perfect level of danger for young readers. Readers both young and old will find this book interesting. Even I as an adult enjoyed reading this book. The way this author writes is so talented that although written for younger readers, adults can enjoy the books almost as much. Yet again, Susan K Marlow weaves character lessons into this exciting work of historical fiction to benefit young minds even more. Circle C is such a fun series for young girls. My daughter and I have read four of them now. This one by far, for me was probably one of the most exciting. Maybe it is my love for mystery. Andi is not really happy that her mother is going to be the new substitute teacher. But just as things start looking up... her and her mother get kidnapped. A case of mistaken identity, but why would someone want to kidnap the school teacher? Interestingly enough, this is based a little on a true outlaw story. Circle C is such a fun series for young girls. My daughter and I have read four of them now. This one by far, for me was probably one of the most exciting. Maybe it is my love for mystery. Andi is not really happy that her mother is going to be the new substitute teacher. But just as things start looking up... her and her mother get kidnapped. A case of mistaken identity, but why would someone want to kidnap the school teacher? Interestingly enough, this is based a little on a true outlaw story. Can outlaws really be gentlemen? Exciting and full of adventure, this book topped them all for me. I couldn't wait to see if someone would find them, or they would escape and maybe even feel a little compassion for the criminal himself. Would you? We highly recommend this series!! Those tomboy girls will love it! Thank you to Kregel and Susan for our free copy of this book to read. We were not required or asked to review it positively. This is the fourth book I've read from this series. It added some danger and mystery to the story which made it a fun little read. The setting of this book is not at the Circle C but involves Andi and her mother being kidnapped by mistake. Will they be able to escape and return home safely? Can Andi be brave when she needs to be for her Mom? I also found it interesting to learn the section at the back of the book about some outlaws that weren't your "typical" outlaw. I appreciate that these books This is the fourth book I've read from this series. It added some danger and mystery to the story which made it a fun little read. I also found it interesting to learn the section at the back of the book about some outlaws that weren't your "typical" outlaw. I appreciate that these books teach historical lessons as well as examples of Godly character. Another really good young girl read, recommended for ages 7-10, but can be enjoyed to younger or older. This story shows that what you see isn’t always what you get, and when Andi and her mother are kidnapped by outlaws, you will be surprised how much you will like the main robber. We also see how Andi over comes her fears, and find out why all of this happen. I loved that there is tidbit of information at the end of each of these books and is filled with historical facts. I received this book throu Another really good young girl read, recommended for ages 7-10, but can be enjoyed to younger or older. I received this book through Kregel Book Blogger Program, and was not required to give a positive review. I received this book from the publisher, but was not required to write a review. This review is 100% my own hon Andi to the Rescue is book four from Susan K Marlow's great series, Circle C Stepping Stones. This one has to be my favorite of the series so far. Andi is quite the little girl. I like how her mother has a bigger role than in the others I have read. I loved how Andi has to become a hero and save her mom from the outlaws. Great book, an easy read. Recommended for children ages 7-10. Boys and girls will love this book. I absolutely loved the characters in this one. The storyline was different from the other stories, which I enjoyed. The historical facts at the back were quite interesting to read about.